Kidney Bun Toons. OW OW OW! | Ty Templeton's ART LAND!! Kidney Bun Toons. OW OW OW! Apparently it’s as painful as childbirth…but I can’t believe childbirth is THAT painful. So, as I head for bed last night, I realize I’m a couple of days late with a Spider-Man job, and it’s actually immoral for me to work on a Bun Toon the next morning until I finish the job on my drawing table. But…about ten minutes after I head for bed, I get a little pain in my side…which changes some of my plans for the weekend, all on its own. 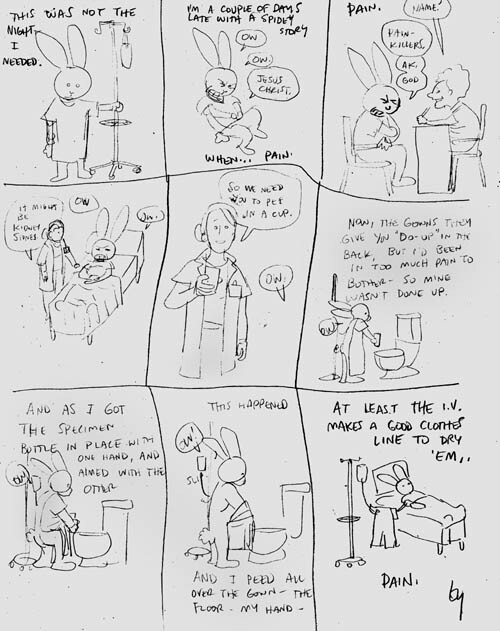 This Bun Toon was drawn in the Emergency Room with paper a nurse found for me. Sorry if it’s difficult to read. As of this morning at about 6:00 am, I passed the stone. They’re right. It’s WAY more painful than giving birth to a child. At least the child gets you birthday presents once they reach the age of ten. 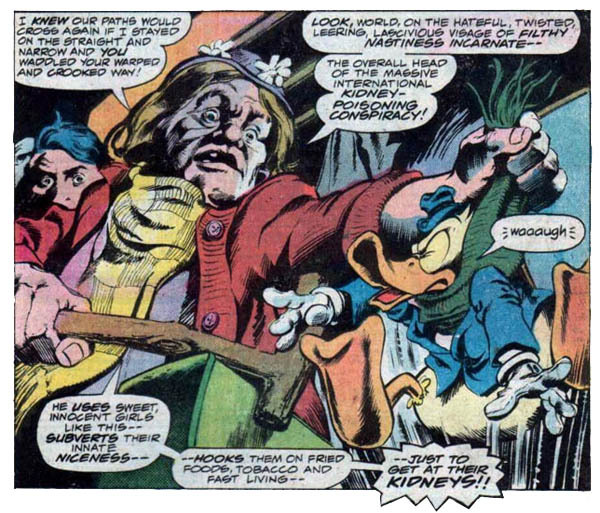 Comics’ greatest Kidney Hero, from Howard the Duck. For last week’s Election Themed Bun Toon, drawn by someone in no pain whatsoever, click above. For the Bun Toon Archive, stretching back a couple of years, click the rabbit in pain above. This entry was posted in bun toons, Bunny Funnies, Ty Toons and tagged Howard the Duck, Kidney Lady, kidneys, ow. Bookmark the permalink. Oh no. I was just thinking about the Seinfeld episode yesterday and wondering if they were exaggerating. I sort of hoped we’d evolved past this problem by now. Damn. So, you are basically saying it was “difficult” to “get out” the Bun Toons this week because you were “stoned”? No, I hope all is well and I applaud your dedication to Bun Toons! Wait, is the fact that you couldn’t be given a replacement gown due to that damn socialist medicine up thar in Canadia? Dammit, now the commies are trying to make America into that socialist medicine too, and we won’t have un-peed on hospital gowns! Damn you Obama!!! Such dedication Ty. Thanks for pulling through to deliver the usual good laugh! Travis, I hope you’re being facetious! The morphine helps. Gave my wife a highspeed potted history of hemp growth in the USA after my first dose of kidney stones. Not something I know anything about, just pulled it from the ether. 2. JUST GIVE ME THE $&@*(& DRUGS! I hope you’re feeling better, and IMO there should be some kind of award for drawing in that condition. Why do these kind of non-punch-related medical issues never seem to happen to superheroes? As painful as this was for you, can you imagine if it happened to the Thing? Now THAT’S passing a stone! In all seriousness though, glad you pulled through alright and hope you are feeling better! Hugs, sympathy and prayers for a full and speedy recovery!!!! Yeouch!! Sending good thoughts for a speedy recovery. And yeah, those gowns make no darn sense. Pingback: Tony Harris Bun Toons! YAY | Ty Templeton's ART LAND!! Was late in seeing this or I’d have written earlier. I hope you’re feeling much better and stay that way! Just happy to hear that your trip to the ER wasn’t for something more serious. Thanks for all the good thoughts and wishes, peoples. Kidney stones, it turns out, are mind-bendingly painful, right up until they pass, or they give you lovely drugs and the pain goes away, and then you pass it, and then there’s no pain at all. So as of Saturday morning, I’ve been right as rain. It didn’t leave any lingering effect on my body beyond a weird bruise where the IV drip was stuck in my arm. Perhaps I fought the needle a bit with all the writhing in pain that night, I don’t remember much from midnight onwards. Couldn’t they medicate you before you passed the stone? They did, that’s the best part of the story. I passed the stone in my sleep, apparently, happily unconscious. YAY for medicine.